In the lesson about inserting rows and columns, I presented how you can insert a new row in Excel. 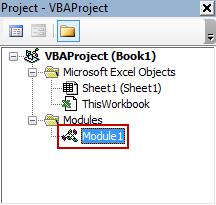 Here, I will show you how you can add a new row with VBA. You don’t have to remember the code which will allow you to insert a new row. In this example, we will use the macro recorder and cut the code that will be useful for us. First, click the button to record a macro. Name your macro and click OK. Right-click any row number and choose Insert. Stop the macro. Go to VIEW >> Macros >> Macros and open the macro window. Choose your macro and hit Run. As you can see a new row is inserted into the worksheet. When you use a macro to insert a new row, you can’t use undo (Ctrl + Z). Use Left Alt + F11 to open the VBA code window. Double-click the module icon from the Project Explorer (if you can’t see it, use Ctrl + R). Selection.Insert Shift:=xlDown shifts down the data from the selected cell(s) and from the cells below. This code will only insert a new row when you click the row number. If you use it on a cell It will shift down data inside this cell. If you want the macro to work in a way that it will be adding a new row not only when you choose a row letter, but also any cell inside this row then you can use the following code. If you want to insert a row above the selected cell, use offset.